Announcing the recipients of two limited-edition PRS guitars and Skype guitar lessons! When we played host to Black Stone Cherry and Shinedown's Carnival Of Madness contest last month, even we couldn't have anticipated the almighty number of cover versions from around the world, not to mention the quality. The bands were impressed, too, and had a hard time choosing their favourites to win a limited-edition PRS Carnival Of Madness electric guitar, Skype guest lessons and a host of band-related goodies. 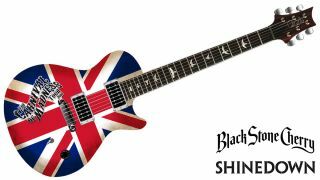 Black Stone Cherry say: "It was a very tough decision to make, and if we could have done it this way, everyone would have walked away with a guitar. But, we had to narrow it down to originality, time put in, etc. "We aren't talent judges by any means, but we enjoyed the fact that Zach and Brayden performed all instruments and sang the song. Well done boys! And thank you to everyone who entered this contest!" "And thanks to all the other submissions - all were great and it was a tough decision… Thanks for all the love." Congratulations to Zach, Brayden and David - we'll be in touch via your YouTube entries so we can discuss getting your prizes out to you. A big thank you to everyone who entered - Black Stone Cherry and Shinedown fans are a talented bunch, that's for sure!